Reiki is at its very basic is a Japanese complimentary therapy that helps people to relax. Hands are placed on or near the client in a series of hand positions. Reiki can be received in a variety of positions but often works best when the client is lying down relaxed on a massage couch or sitting in a chair. Some people have reported that the practise of Reiki helps them ease pain from physical ailments while many find it beneficial for overcoming mind-based issues such as stress, anxiety, addictions, sleeplessness, and Attention Deficits. Often people report that Reiki has helped them improve their self-confidence, when tackling issues such as past traumas and emotional baggage. Reiki helps young people who are struggling to manage their emotions as well as children and adolescents with emotional, learning and behavioural differences including ADD/ADHD, dyslexia or similar language processing difficulties, depression and/or anxiety, mood disorders and emotional dysregulation (in other words, those who struggle to regulate their mood and are prone to unprovoked emotional outbursts). A session normally lasts for an hour but the first session is sometimes a little longer as it includes an initial consultation. A Reiki session will always be fully clothed. If you want to remove shoes and or a sweater/blazer in order to be more comfortable then that is fine. A session can be done using touch, no touch at all or a combination of both. The choice is yours. Relaxing music can be soothing while receiving your treatment; however, you can choose to be at ease with the sounds of the immediate environment. Treatments can be done with or without talking, again you can decide. If you have already had an initial assessment, you will be asked what area of your body or aspect of your life you would like to work on. You lay on the couch, get comfortable, and your treatment begins. After your session ends, you will be offered a glass of water and where possible, a small healthy snack. Depending on the duration of your treatments, you will be asked to give a small amount of feedback on how the series of sessions were for you. This is so I can evaluate progress and check the sessions are beneficial to you. This normally takes around 5 minutes. Who will deliver my session? Paradox Reiki has an amazing way of making you feel calm and relaxed. Everything is perfect, down to her calm and assuring voice to the soft music playing in the background to the temperature of the room – everything comes together to make a beautiful experience. Youth Feedback – issue: Depression and feeling paranoid that people didn’t like them, low self-esteem. It’s natural, I literally felt at home when I came for my treatment. That’s not just the environment; it was the vibe I felt from Paradox. I remember feeling she “got me” like I didn’t need to explain feelings. Paradox as warm gentle hands that breath her energy; it was nice to have that 1:1 attention. Thank you. Young Person who became interested in energy work as a result of the treatments and the positive effects they felt. I have been a youth worker for the past 12 years and am currently working in a pupil referral unit in South-West London. I have worked with a variety of young people: those with learning, behavioural and emotional difficulties to those who just require assistance navigating safely through adolescence. I am passionate about my work and really enjoy working with young people; they are truly my reason for getting out of bed in the morning! The practise of Reiki brings people together in a community; there is an old folk saying: It takes a village to raise a child and I strongly feel I am a village member playing my part. The youth of any society and their well-being are in part a reflection of the support and guidance from the adults around them. Reiki is a practise in which I can offer support to young people in addition to nurturing and guidance. 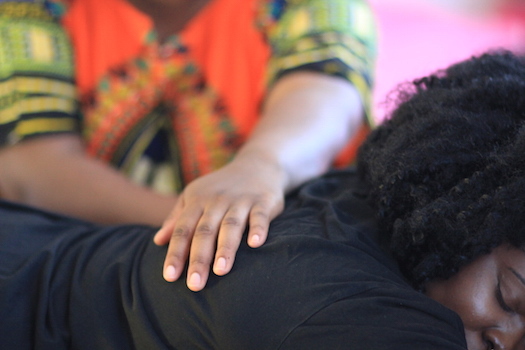 Ultimately, the practise of Reiki can promote peace, calm and stillness in the next generation of young people who will ultimately shape our tomorrow.